Make simple puppet from simple materials - or recycled materials. White Glue and sticky tape or staples. Sequins and ribbons (if your rich) to decorate-but not necessary. Show students several examples of Chinese dragons. show them the parade dragons that weave through the streets. Show students some Chinese puppets and present a little background on Chinese culture - including the theatre. Review each step with students - show various dragon images to spark and idea -but encourage creativity. On card, draw two heads and two tails, mirror image. Tracing Paper can be used to draw the mirror image. Trace then flip. Many images of Chinese Dragons can be found online for inspiration (Do a Google image search). Size of heads will be determined by the size of body you choose to make. 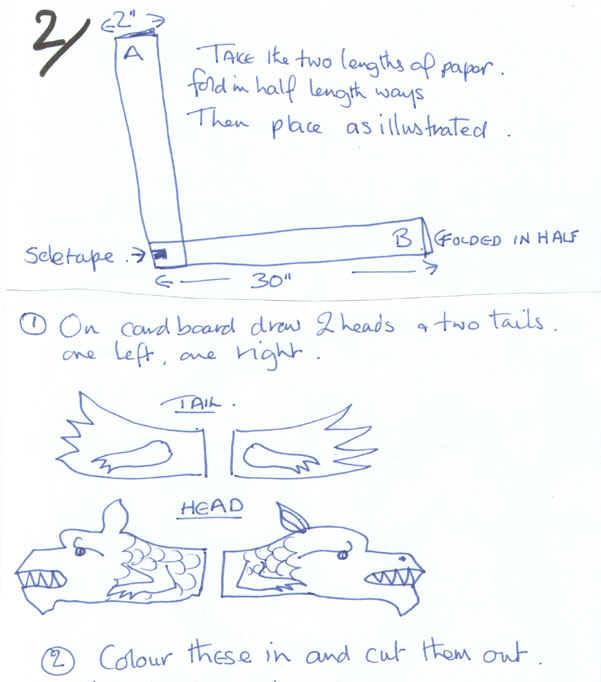 With wrong sides facing, cut triangular strips from the pretty scrap paper and glue or tape it to one of the crowns of the dragon's head and another lot to the end of the tail. Fold the two long lengths of paper in half long ways so that you have two lengths approx. 2" x 30" (5 x 76 cm) (Note: Save some old bulletin board paper for this project. Just make the strips 36 inches long to save cutting. Stack up several sheets and cut many 4" strips (or wider strips - depending on size of puppet). Kids could even decorate the strips a head of time with all sorts of experimental painting/stamping/printing techniques. Place two ends of at right angles- held together with glue or tape (or staple), so that one end (A) is up and the other length (B) is to the right. 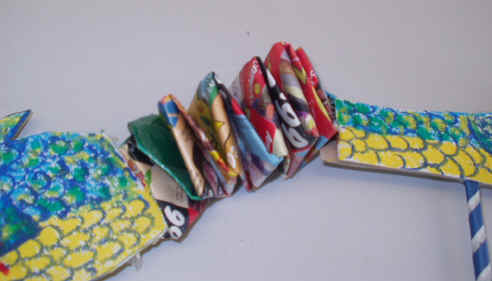 Form a paper spring by folding A vertically down. Then B horizontally across to the left. Fold A vertically up, then B horizontally across to the left. Repeat these moves until the length of paper is used up. 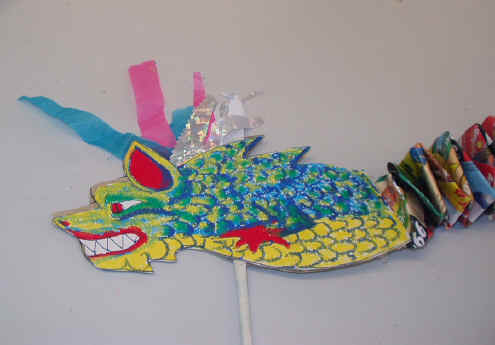 The long strips of paper are concertina into a spring and each end is attached to the dragon. One end to the head part and the other to the tail. (You have probably all showed your students how to make springs with two strips of paper to make their pictures pop out). Glue or stick the second end together with tape (or staple). You can even make your own sticks! Roll up some paper into a thin tube and glue the seam. Glue or tape or staple one end of the spring to the body end of the head. Fasten the other end to the body end of the tail. Glue the second head and tail to the first so that the end of the sticks and paper spring is sandwiched. The puppet can then be embellished with sequins etc. Have some fun creating an Imperial Dragon and add legs that stick out 3-D with five talons/toe. Maybe even attach the legs with brass brads so they move. NOTE FOR MIDDLE SCHOOL: Make some Giant Yard Art Dragons! Use political sign wire holders for support. My sixth graders LOVED working in group projects to make yard art. Yours will too. They always had a take home project, too. Maybe the take home project could be Chinese inspired relief prints? Head images and tail images should be mirror images. Student could plan on scrap paper, then cut their best out and trace as a pattern. Horned Dragon (lung) most powerful generalized type of Chinese dragon, which can produce rain and is totally deaf. Homeless Dragon (Ii) that lives in the ocean and another type (chiao) that is scale-covered and usually inhabits marshes but also keeps dens in the mountains. Dragon King, which actually consists of four separate dragons, each of which rules over one of the four seas, those of the east, south, west, and north. 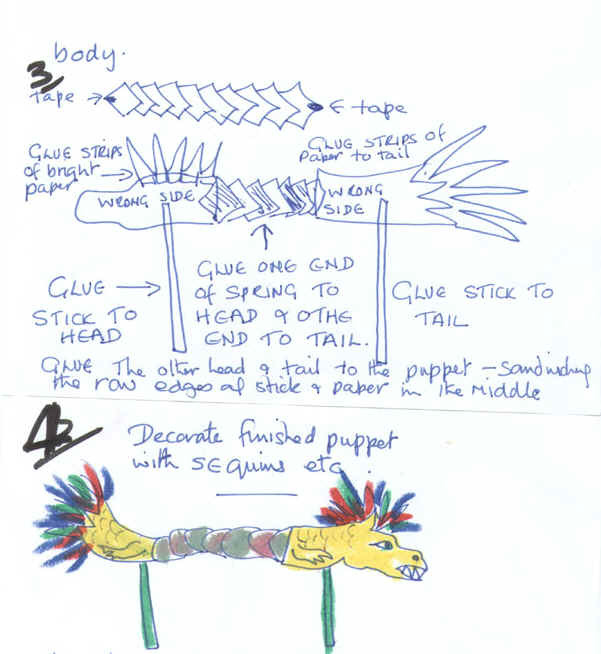 How can you adapt this dragon puppet lesson to teach a little Chinese Mythology? There is also the Imperial Dragon. This is similar to the process I learned at the Nelson-Atkins Museum of Art in KC 20+ years ago. The only difference, with most classes we would tour the section of the museum that related to our work. We also used onion skin paper, or what was once called onion skin, its very close to vellum for all the younger teachers out there. I like the transparency of the medium. Over the years I changed and added a few elements. For heads and tails I used tag board (a little lighter than poster board). And where they show the poles to hold the puppet, we use to cut up discarded or unused parts of Mat board . Then the kids would glue the two ends of the dragons body. Staple the head and tail. Oh yes, we scored and cut the scales in the face with a knife and then popped out part (like opening a shutter) so that more light would go through and it looked like scales -- much more texture that way. We also added feet with tag board -- and the legs and tail and head would have brads so they could be posed in different situations. Also add triangles to the top of the dragons back, and streamer paper to have fire, this also looks nice with crinkle crepe paper. After we made the project, I would have a lamp set up for the kids to use the puppets as shadow puppets. Of course it was a puppet unit. You can relate Javanese puppets well with Chinese dragons and Japanese Bunraku (theatre). Experiment! From Kristen Puhl -Student Teacher - "Gung Hay Fat Choy!" These are very easy ones made from heavy paper or card stock (maybe even free corrugated cardboard) and hooked together on the back side with string and tape. There is a how to online. The site gives you patterns - but it would be so much more fun for the kids to make their own monkeys. Puppets are big in China. There are many ideas out there that you can do with simple materials - that won't take much time. Ideas are "out there" for monkey masks, paper bag puppets -and so many more easy projects that could be done in just one day. 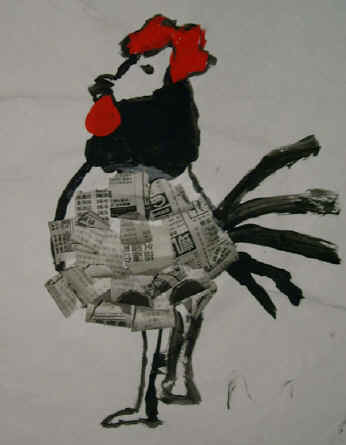 My kindergartners are beginning a rooster painting/collage. We are looking at Picasso's Rooster and drawing/painting black lines to make a rooster, adding red combs and wattles. The feathers on the body are cut from Chinese newspaper, glued overlapping and curled. The newspaper cam from a Chinese grocery store. Click image for larger view. See PowerPoint of images Jill used. Go to Chinese Paintings.com for more images. Enter rooster in site search. I taught the second graders how to draw and then paint a rooster for a spur-of-the-moment art class. We have been playing doodle-drawing from a new book that was donated to the 'free art' section of the art book shelf from time to time and they were having a lot of fun with it. First we talked about what the year was predicted to be like, and the personality of someone born in the year of the Rooster, and what people did for Chinese New Year. I found a rooster graphic on a Chinese New Year website and the Chinese characters for 'Year of the Rooster'. We drew it together with them following me, bit by bit, building the drawing with shapes they all knew how to make. We practiced once and I gave them big paper to draw it again as big as possible. I had been given some of those paint squeezable marker things by the PTO after a function. I would have never purchased them, I would rather the kids learn how to use a brush. But they were perfect for our fun rooster and the colors were vivid. They enjoyed trying out the new paint markers and made borders around the rooster with all the colors making dots and squiggles. Looked like a bingo game was about to break out to me! It was a fun time and they all were making rooster sounds after awhile. Watercolour painting techniques using Chinese dragons as motivation. 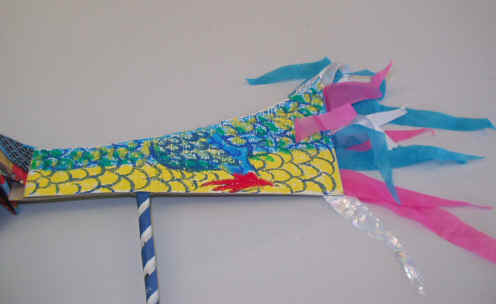 You can have hanging Chinese Paper Dragon Decorations around your room during the lesson. After reading stories about Chinese New Years and various traditions as well as showing a variety of dragon paintings, the children were instructed to create their own dragons, which will be transformed into watercolour paintings. Kids draw dragons with regular pencil on photocopy paper. The decide which lines they like best and outline them with black magic marker. Using the window as a light board, drawings are transferred to watercolour paper with blue pencil (which will not show up as much after they are painted). Ideally, erasable blue pencils are used, but yellow or blue water watercolour pencils work as well. The details of the dragon are painted in, although it would be best if the backgrounds are painted first. I've found the kids impatient to get to work on the "main event", so once the dragons are painted, they're asked to squint to determine the "main colour". The next task (after the dragons are dry) is to determine the complementary colour and to fill in the background with a wet on wet wash, taking care not to get the water onto their dragons. Dropping in analogous colour and applying salt to lend a sparkly effect were great favourites. Using reds and yellows to create breathing fire was also an exciting step at this point. Last and final step, if the initial dragon has gotten "lost" in the background was to take a fine liner, preferably permanent, and reinforce the details on the dragon, with special attention paid to eyes, claws and whiskers. Does the foreground stand out from the background? Has the complete page been well used? Are there any unexplained white or left out areas?